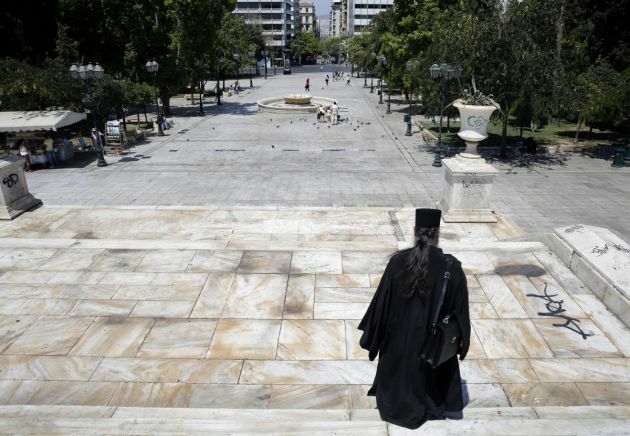 (Photo: REUTERS / Yannis Behrakis)A Greek Orthodox priest walks through an empty Syntagma (Constitution) square in central Athens during a visit by German Finance Minister Wolfgang Schaeuble July 18, 2013. Greek police have banned protests and traffic in downtown Athens on Thursday during a visit by Schaeuble, whom many accuse of forcing painful cuts on Greece in return for the multi-billion euro bailouts keeping it afloat. It is a great honor to be with you here today, and to receive this most prestigious of honorary doctorates. We find ourselves today at a complex point in the life of Europe. There are many issues that appear to be pulling us apart, and our political leaders are making difficult decisions about whether or how to move with those forces, or to resist and seek the strengthen the ties that bind us. There are great uncertainties. In the week after the anniversary of the Bataclan, we are aware of the great threats of disorder, of the reality of those alienated, disturbed, radicalized. We are aware of the cry of dispossession and alienation in the British referendum and the US election. We hear the cry, and fear its echo across Europe, especially in those countries where the roots of democracy are shallow and the weeds of authoritarianism spread far and wide. Add to this the major economic and social challenges facing the continent, and it may seem frivolous to be talking about a vision of Europe in the 21st century in light of the common good. In the midst of so much uncertainty, is it not better simply to prioritize our own well-being, whether that be as an individual, or as nation states? That is what many are saying. "The European elite is wrong. We must look after ourselves." Certainly for many the response to Trump has been more Europe, by which they mean more centralism, more imposed federation, less flexibility. My argument today is that such a response is wholly inadequate for the challenges that we face as a continent. In order to overcome these challenges, we need 21st-century answers. And we will find satisfactory answers only if they are grounded in a vision we can all recognize, and one that seeks the common good. It is no use treating God as a means to a 21st-century Europe: to do so is the creation of an idol, not the service of the true God whose revelation in Christ is the foundation of our values. I shall be seeking to argue that Europe's future lies in a process of subsidiarity, re-imagination and inclusion, especially the development of concepts of intermediate communities of many kinds. This is a theological vision, one that allows commonality of vision, but sets strong boundaries to what is acceptable. We need a 21st-century response that echoes Jean Monnet's words at the signing of the European Coal and Steel Community Treaty: "This treaty... should open a breach in national sovereignty, by substituting for the barriers of the past, which have until now divided and impoverished us, common rules accepts by all and applicable to all for the common good." The immediate concern of the six nations that signed the ECSC Treaty was post-war reconstruction, based on mutually-beneficial economic and trade policies. Today we are faced with a different set of challenges. But our response to these challenges - Brexit, the migration crisis, religiously-motivated violence and terrorism, and many other issues - must be to reach for the common good, intermediate institutions (schools, charities, companies, churches, civil society, families above all) and subsidiarity, rather than the barriers of the past. We must eliminate the barriers, tear them down - but not erect others, even more dangerous. You may be skeptical of a British cleric talking about the common good and a shared vision for the next century - and with reason. To view the United Kingdom's decision to leave the European Union as a raising of the drawbridge from all of our relationships with the European continent is something that none of us can afford. A vision for Europe must go beyond the boundaries of the European Union. It is in that spirit that I want to frame my words to you tonight. The path ahead for Europe must be, ultimately, of a catholic Europe. I do not mean Roman Catholic - although later in my speech I will talk about the need to draw on the deep well of Catholic Social Teaching, in order to develop a vision for Europe in the 21st Century. Since the creation of the ECSC and subsequently the Treaty of Rome, prosperity - enumerated most visibly in material and economic prosperity - has been a central pillar of European cooperation. The Treaties of Rome and Paris both refer to "the constant improvement of the living and working conditions of their [member states'] peoples". When we look at the progress made since the end of the Second World War, it is hard to argue that economically, European cooperation has been anything other than a great success. Of course, since 2008, this has not been the whole story. In Southern Europe particularly, talk of economic success would be met with confusion and anger. Greece is the clearest example of that. It was urged to enter the Eurozone on essentially a false prospectus, with declared debt well below the reality, and thus outside the criteria for Euro entry. There was a level of collusion by all concerned, who wanted more countries in the Eurozone. By taking on what is essentially a foreign currency, a country loses the ability to service its debt by printing money to inflate its way out of its problems. It thus depends on trade balances and economic activity to generate income sufficient for all its needs, including debt service. When the Great Recession arrived in 2008, it is little surprise to us now that Greece could not pay the bill. And because of previous mismanagement and even corruption by an elite, the poor of an entire nation have been put effectively into involuntary bankruptcy. 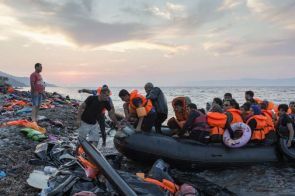 The weight has fallen on those least able to survive, and when their own suffering was aggravated by the desperate plight of hundreds of thousands of refugees, and now millions, little help was given. What we have seen is the global market system, and especially the EU, lend people money to buy things and then strangle their hopes and futures when they cannot repay. What we now have is the biggest debtor's prison in European history. So on the one hand we look at the progress since the war and see a huge increase in the material wellbeing in the vast majority of Europeans. But on the other we see policies that are pushing and keeping large sections of entire countries in increasingly desperate circumstances, with no apparent vision for how the circumstance might be overcome. The problems are accentuated by aspects of European Union practice in terms of centralization, corruption and bureaucracy that provided cheap and easy ammunition for the opponents of the European ideal, and in the end created a mythology which has been absorbed in popular imagination in northern Europe and on its fringes. At the same time Europe seems to have been in three layers: Brussels, the nations and individuals, or consumers. Lobbies exist, for farmers, or fish or many other sectors but there is less sense of towns and communities, of families and informal groups being valued, enhanced, and liberated. Yet God's creation of human society is far more than individual or bureaucratic: it is relational, and for it to be so every form of human relational institution from the base community of the family, to the small and medium sized business, or the church, or anything else must be treated as possessing legitimacy and value in the rich and luxuriant mix of European human society. It is, after all, these intermediate groups that have been behind the success of our countries and societies. This neglect of the intermediate seems to me also to be at odds with the vision of the political leaders who first developed post-war European cooperation - Monnet and Schumann, Adenauer and de Gaulle. It was a vision that was deeply moral, deeply Christian, and full of hope. A vision for "the constant improvement of the living and working conditions" of course requires economics as a tool for delivery. But we seem to have lost sight of how economics was harnessed to enable human flourishing, rather than economic structures enslaving human beings. What is economic cooperation for? What is our vision for it? Is it simply that the line showing economic growth on a chart goes up? Or is there something greater - more hopeful - driving policy development? I want to draw a distinction here between what we can call the general interest and the common good. As I have alluded to, the general interest is concerned with the general rise in the economic tide and makes that assumption that this will benefit everyone. My personal experience in Liverpool certainly showed me that this is not true. The common good is concerned with a rising tide that truly lifts all boats. So national and regional economic policy must be reimagined - realigned - to liberate human flourishing. The means being concerned with growing inequality across the continent - not only in incomes, but also in wealth, health, education and many more areas. This reflects a changing reality that, "although absolute levels of poverty and economic disadvantage [are] still highest in the former Eastern bloc, the sharpest contrasts [are] now within countries rather than between them"
It is through such concern that we will being to revive a vision of what economic is for that is more hopeful and human-centered than the more mercantilist policies we have seen in recent years. The social makeup of Europe in 2016 is drastically different from the Europe of Monet and the other founding fathers. Since the reunification of Germany and the fall of the Soviet Union, we have seen a dramatic shift in how we understand 'Europe' - seen most clearly in the membership (desired or achieved) of the European Union. Newly independent states have emerged, populations have found themselves able to move more freely across the continent. 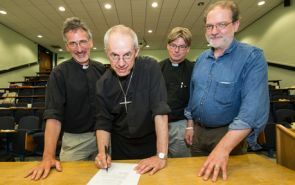 (Photo: Church of England website)The Archbishop of Canterbury, Justin Welby, was first to sign a register for a credit union at the General Synod of the Church of England in York in July 2013. And yes, despite more integration at a political level - since the end of the Cold War, the EU has grown from 12 to 28 (soon to be 27) member states - there has been a notable and damaging absence of a clear process of integration within Europe, quite aside from the changes that we have seen in terms of those coming from beyond Europe's borders. As European has integrated economically - it has ignored the need to integrate our values, culture, dreams and ideals. In short - we have no common vision of what Europe is, beyond an increasingly complex web of economic activities. Beyond this, the closest we have come to articulating what Europe is, is by talking about what it is not. Since the fall of the Soviet Union, Europe has been defined (particularly at its external borders) by exclusion, rather than inclusion. We need to recover that vision of what Europe is, or what we wish it to be, very quickly, and I will address this in the latter part of my address. The failure to adequately address integration within Europe has clearly had a detrimental effect on being able to successfully address it with those who come to Europe from elsewhere. This initial failure derives in part from an assumption that by and large, we are all the same. Europeans are fairly similar, we say, perhaps subconsciously. We generally look the same, dress the same, our past times and interests tend to overlap. Many of our cities look the same, particularly in Central and Eastern Europe. But I would argue that these common features only amount to a superficial likeness. We face each other, and see something familiar, but we do not interrogate more deeply into whether this superficiality leads to a deeper cultural likeness. We are finding this to be the case even within the borders of the United Kingdom. Most prominently in Scotland, but also in Northern Ireland, Wales - even Cornwall - we are hearing more and more articulations of a deeper and distinct understanding of culture, of history and so on. Those articulations are amplified and exacerbated significantly at the pan-European level. Across Europe, we face each other, but the superficiality of that facing is utterly deceptive. In a powerful meditation on St Ephrem the Syrian's Hymns on Paradise, the Irish theologian David Ford talk about face-to-face meetings being of 'salvific value' - that in them, "many of the most significant things in our lives happen"
of the beauty of His hiddenness, of the splendor of His majesty. but only His Child is sufficient for the might of his glory. The poem, and Ford's own meditation on it show us that when we face each other, deeply and sincerely, we begin to catch a glimpse of our creation, our Creator, and thus our shared humanity. We face each other not as economic beings, but as individuals and through our intermediate institutions. On Monday we had a wonderful meeting at Lambeth Palace of Rabbis and Anglican clergy, facing some of the toughest questions that divide and provoke us, but doing so on a scale that is human and may well be effective. But if we are mistaken in what we think we see - if we mistake the superficial for the deep - then our approach to issues such as integration will be the wrong response, or indeed no response at all. The flip side to all of this is the mistake we make in assuming that superficial differences - such as ethnicity - are deep and intractable differences. The culture of a nation or ethnic group and its ethos - the collective values of a people - are linked and influenced by how people look. But that culture is also something other. Simply arguing that because we look the same or different to another person or individual, they do or do not share our culture, values, priorities, etc., is a dangerous assumption to make. And because we have relied on a notion of superficial likeness to articulate what we believe Europe is, we have therefore failed to put down deep enough roots that give us the confidence to overcome superficial differences when they present themselves in front of us. Our inability to successfully integrate parts of those groups of people who have immigrated into Europe's borders is therefore a symptom of our inability to define and live out a deep and confident European identity. That failure has had clear consequences. First, it has made it easier for those who seek to do harm to the citizens of Europe - in Paris, in Nice and other cities - to indoctrinate their followers with a narrative of what Europe is for and what it is against. I will speak in more detail later about what our counter-narrative to this should look like. The second consequence is that nations within Europe begin to turn inwards, seeking comfort and stability in national identity - which has, in some circumstances, manifested itself in the election of populist and nationalist governments and politicians. I want to turn to this now and consider the political state of Europe. The political conversation in Europe has, naturally, been dominated by the United Kingdom's decision to leave the European Union. Not only will the decision result in a contraction of the Union's membership for the first time, but it has also opened up the space for discussions about the nature of Europe going forward. Whatever our perspectives on the rights or wrongs of the decision, the role of political leaders, from both sides of the English Channel, must be to ensure that both parties can thrive in the new reality and that the pursuit of the common good remains at the heart of the process. But the bigger political change that has been developing across Europe is not Brexit, although there are strong arguments to suggest that they are connected. In recent times, we have seen what I would consider to be a rapid rebirth of nationalism across Europe. We have seen the election of nationalist governments in Austria, in Hungary and elsewhere in Central and Eastern Europe. Here, in France, the Front Nationale dominate the polls. In the United Kingdom, as I have already mentioned, much of the debate was about the UK's national identity and how that interacts with our relationship with the rest of Europe. In the post-war period, the "economic prosperity, social peace and international stability" that defined the era, the visceral or even rational need for the nation state began to evaporate. Across Europe, the borders that had defined ally from enemy over the previous two centuries began to blur. So what has changed? I will not attempt to assert a correlation or causality between the two, but I would observe that we are currently living through a period where a younger generation of Europeans may be less wealthy than their parents, where the social norms of many countries have been challenged and the expectations of social welfare that have been afforded to my generation my not be viable for the next. And we find ourselves in a world lacking any true stability. Is it any wonder that faced with this, people have begun to turn inwards, towards the hard borders of the nation state? We cannot say that the rebirth of the nation-state is a good or bad thing. If it is a reality, then it is one that we must put to good use. At this moment, when we are talking about the values and vision of Europe in the 21st Century, then we must be having the same conversation within our respective countries. In a few weeks, I will lead a debate in the House of Lords on the shared values underpinning our national life and how they shape our public policy priorities. How the state is lived out is a challenge for all of us, and one that has perhaps been somewhat forgotten during a time of European stability and prosperity. In the midst of this rebirth, was need to be speaking into our national contexts - speaking of and, more importantly, demonstrating national values and virtues that are vital to the pursuit of the common good - including, but not limited to hospitality and generosity, in contrast to a propensity towards mercantilist and inward-looking perspectives. If we allow our national and international political contexts to define our values and virtues, then we will be disappointed. Values emerge from histories of interaction and are rooted in stories of virtue, above all in Europe the stories of the Judaeo Christian tradition. They are embedded as much in informal and intermediate groups as in the state, probably more than in the state. There is a further factor that has a significant and growing impact on how we understand what it means to be Europe, and how to live that out in a commitment to the common good: religiously-motivated violence and its outworking within Europe in the most barbarous acts of terrorism. We have not experienced religion as a contributing factor in global politics since the Wars of Religion in the 15th and 16th centuries. It is a legitimate to therefore ask: how can we expect to respond effectively to religiously-motivated violence across our continent if we don't have the ability to understand it? You here have experienced it in all its fury and terrible cruelty. Even watching the anniversary celebrations in England we felt again the horror and wept. How we feel for you! As such, one of the major challenges is to work out how we talk about religion in Europe. On a continent that is seeing growing secularism and apathy (in some cases outright hostility) towards religion and religious people, a challenge for all of us here today is to find new ways to share our religious vocabulary with the rest of the continent. This also means feeling confident to talk about the Judeo-Christian tradition of our continent and why this tradition needs to be reflected in our understanding of Europe. This is not - for those concerned - a call for a return to Christendom, but being open about our tradition and heritage - both the good and the bad. In a speech I gave in September to head teachers of Church of England schools, I said - uncontroversially in my view - that in order to defeat terrorism, we need to understand the mind-set of those who perpetrate it. To my surprise, a small number of media commentators viewed my comments as appeasing terrorists and their acts. However depraved it may be, groups like ISIS have an ideology, indeed a theology - which is at the heart of their propaganda, and therefore the driving force - which holds an apocalyptic understanding of human history, not as a loose term but in its strictest technical terms: they believe that the world is about to end, that the Prophet will return with Jesus, and will defeat the western powers. It's very difficult to understand the things that impel people to some of the dreadful actions that we have seen over the last few years unless you have some sense of religious literacy. You may reject and condemn it - that's fine - but you still need to understand what they're talking about. And in order to understand, religious people in Europe must regain the ability to share our religious vocabulary with the rest of the continent. If we treat religiously-motivated violence solely as a security issue, or a political issue, then it will be incredibly difficult - probably impossible - to overcome it. A theological voice needs to be part of the response, and we should not be bashful in offering that. This requires a move away from the argument that has become increasingly popular, which is to say that ISIS is 'nothing to do with Islam', or that Christian militia in the Central African Republic are nothing to do with Christianity, or Hindu nationalist persecution of Christians in South India is nothing to do with Hinduism. Until religious leaders stand up and take responsibility for the actions of those who do things in the name of their religion, we will see no resolution. Of course, it is insufficient to only use our understanding of religious language in a defensive or preventative sense. In the United Kingdom, our counter-radicalization program in schools and universities is called 'Prevent', which I believe sums up the overall approach to religious extremism. Rather than simply seeking to prevent 'bad' religion, however, we have to offer an alternative vision of the role of faith in our societies that is more convincing. That is more profound. That is more satisfying to the human spirit. And where to do we find a better vision than in the gospel of Jesus Christ, in the good news of Christ? So finally, I want to speak to you about why I believe it is absolutely necessary for us to reclaim religious language for the common good of Europe. And the way we can do this is to set a vision for a 'catholic Europe'. The answers that we have given before to the challenges that face Europe are no longer suitable. Here, in France, I would say - perhaps somewhat provocatively - that laïcité has served its purpose. Materialistic laïcité, which is not laïcité in its original form, is not capable of dealing with the challenges of religious groups with powerful, internally coherent, albeit evil narratives that challenge entirely understanding of what a righteous and good society looks like. The same is true of many other European states, and particularly the UK, without laicite but full of secularism. So it is time to offer new solutions. The values of vision of the founding fathers of the European project drew heavily on Catholic Social Teaching. Catholic Social Teaching has played a significant role in the development of my own faith. I believe that the values and vision for the 21st century need to be catholic (with a small c). By this I mean that it needs to be broad, flexible, comprehensive, with a fundamental drive towards inclusion. Inclusion refers to people but also to institutions and human gatherings and groups and communities, as such, not just as individuals. And when things are flexible, comprehensive and inclusive, in reality, they cannot then be simple. We need to recognize that in order to come up with a workable and convincing vision for the 21st century Europe, we must accept that Europe needs to become more complex. This is something that I have learned through my years working in conflict situations. Conflict is not solved by simplification but by recognizing the complexity of the situation. Complexity will lead to untidiness - a teenager's bedroom being a perfect example! In the context of our discussion today, complexity means recognizing difference and valuing it. Europe is not the United States of America. It is not a nation state at this point. It is a collection of states with some common culture and some very different cultural aspects. To that, we must also add an unbelievably bloody history. Building a good Europe - which must be the goal of a vision based in the common good, therefore means addressing complexity - accepting it, and embracing it. How then can we use Catholic Social Teaching as the foundation for this vision for Europe in light of the common good? First, the vision for Europe needs to renew its commitment to true subsidiarity. Having structures of economic, political and social relationships that liberate subsidiarity will make accepting complexity more realistic. It seems to me that current debates about what Europe is have fallen into the trap of equating strength and unity with simplicity. As I have just said, the opposite seems to be true. Attempts to explain European structures and identity with a single overarching story have ended in failure because they have not allowed sufficient flexibility for these structures to be lived out below the continental level. There is, as I hope I have made clear, and important story to be told about Europe, which will help us set values for the 21st Century. But this story is not something that can be applied generally. All stories of identity and belonging are applied at the local level. The story of Europe, as well as the structures of its institutions, must therefore be applied locally. This point is key if we are to do better at integration in Europe. Integration does not occur if the values and virtues that are important are abstract and distant from the lived reality. They must recognize the complexity of diversity - noting that religious and values-based beliefs will require complexity - whilst also assertively proclaiming values that are non-negotiable, for example our commitment to democracy. This is a commitment, incidentally, that will be greatly strengthened with a renewal of subsidiarity within Europe. The second CST concept that is vital for a 21st century vision of Europe is solidarity. Reclaiming the Christian definition of solidarity for the common good is vital if we are to reimagine Europe so that individuals and communities are no longer left behind or excluded, but are deeply and sincerely valued. A deep commitment to solidarity will be reflected in the relationship between the 'center' of Europe and its margins. As I have already spoken of. Solidarity must extend right across Europe - particularly to those parts that are most heavily touched by the changes that are taking place around and outside Europe, not least the arrival of migrants and refugees into Southern and South Eastern Europe. Solidarity must therefore not simply be based on the superficial likenesses that have defined how we have understood Europe. The vision for Europe in the 21st century must develop deeper roots - roots that are deep enough to overcome difference and are not confused with superficial likeness. A sense of gratuity - what Pope Benedict called 'grace in action' - must also be a defining feature of 21st century Europe. European citizens cannot simply be seen or treated as consumers. Gratuity is about going beyond worldly understandings of exchange and equivalence and recognizing that within human relationships there is a real capacity to enjoy God's economy - which is one of abundance, not scarcity. Economic systems must be rooted in the fundamental understanding of the inherent value of the human being - that humans are not simply economic units. This applies as much to those who live beyond Europe as those within. The final aspect of CST that I want to apply to the vision for Europe in the 21st century is creativity - by which I mean recognizing the creativity of what has been achieved in Europe over the past sixty years. The remarkable transformation of life for the everyday European citizen is something that must be cherished and celebrated. It is also something to be exported: Europe is not a cozy club for its members, it should be a beacon for other parts of the world. The vision is something that should be shared with others, whilst always remaining humble in the face of the failings of European imperialism, where this vision was imposed rather than shared. These can be the building blocks for a vision of a catholic Europe in the 21st century. One that is unwaveringly committed to the common good and to the flourishing of all.